Hello friends! Thank you so much for stopping by the blog! I hope you are having a wonderful week! I have been pouring myself into all things Blonde Ambition Southern Tradition this past week, learning as much as I can about editing and posting content. I have been challenged so much by this blog. It is my goal to learn as much as I can about photography, editing, and creating fun content that is true to myself! I want to thank each of you who read my blog and follow along on Instagram and now Twitter! Your support means the world to me! One of my favorite parts of summer is bringing out my summer wardrobe and accessories. I LOVE a great pair of colorful shorts! ( When I have a good sunless tan of course! ha! ) On this particular day I wanted to be comfortable but still look put together. 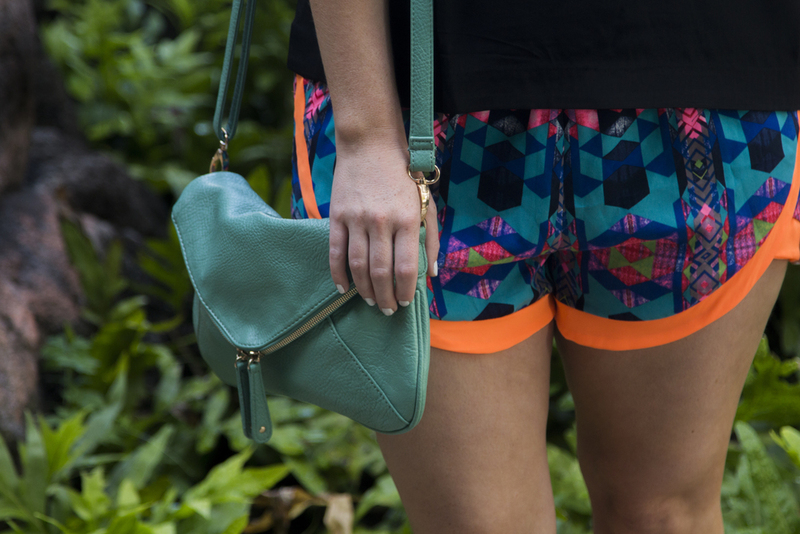 Since we were in a tropical climate I opted for these colorful printed dolphin cut shorts to stay cool. To keep things breezy I paired the shorts with split back top from Forever 21. This top was a bit of a stretch for me since I always dress conservative. I don't think I pushed the envelope too much! My braided sandals were perfect for site seeing, exploring cliffs, and strolls on the beach. My shades were a must on this sunny day! I love their fun shape so much. I have really been into unique frame shapes lately. I may have a small sunshade obsession. My mint leather bag from Urban Outfitters was perfect for holding all my essentials. Thanks for stopping by! I really hope your enjoyed this simple little outfit post! Next time on the blog- Hawaii Vaca Part 2! This will be the last and final post on my Hawaii adventure. I will be covering North Shore, Sharks Cove, Pearl Harbor, Dole Plantation, Queen's Bath, luau's, kayaking, helicopter tour, and so much more! I can not wait to share these pictures with y'all!